It’s weird how so many people from the small community I grew up in south of Chicago has so many ties to Southwest Michigan. So many people I grew up vacation on the beaches and at the state parks. It’s always interesting to see photos of places I recognize in my Facebook feed from people I haven’t seen in twenty years. One of those weird connections also involves my brother’s in-laws. They have family in the Mattawan area that they celebrate Christmas with every year and his wife’s parents like to camp at the Covert/South Haven KOA Holiday. With his in-laws really in to camping, his daughters have gotten in to it as well. The youngest one wanted to celebrate her sixth birthday at the campground, so they invited all of my family to join them for a party. My parents and aunt drove up the morning of the party while J, B, and I (L is on vacation with J’s parents in Wisconsin, so he missed it) slept in a little before heading to Covert. We spent the whole day just hanging out, playing with the older girls, and, of course, eating cake and ice cream. I actually thought J and I would leave around dinner time, but B had fallen asleep and it was such a nice day to just hang out that we decided to stay. My sister-in-law’s dad had been talking about a nearby pizza place that they found on a previous trip and really liked. Everyone was on board for dinner, so my brother called in an order and he and I then went to pick it up. 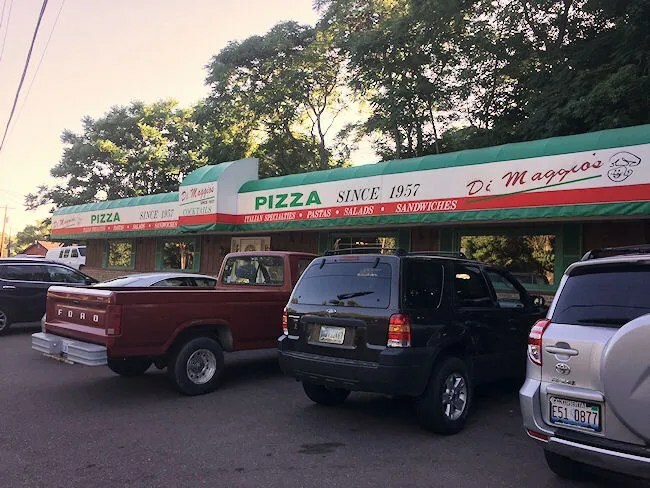 DiMaggi’s Pizza & Burgers is a classic lakeshore tourist type restaurant. It sits near the corner of M-63 and West Hagar Shore Road less than half a mile from I-196 in the small, unicorporated community of Lake Michigan Beach, Michigan. 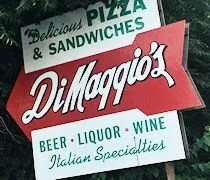 When you get a look at the building that houses DiMaggio’s, you will wonder if you hit a time portal somewhere along the road. The same family has owned the place since 1957 and I’m guessing it looks the same today as it did way back then. I unfortunately didn’t get any pictures inside the place. My brother ran in to get the pizzas while I found a spot to park. The restaurant was packed and the parking lot is pretty tight. I was double parked behind someone so I stayed with the car. When I did get in to a space, I went in to help him but he was already paying. I just quickly scanned the dining room and was a little bit in awe of just how much of a snapshot of the past the restaurant is. The vinyl bucket seat bar stools, old beer mirrors, plastic booths, dark lighting, dear head on the wall…there’s so much about this place that screams retro. We had put in an order for three large pizzas. The hardest part was deciding on what to get. There were eleven of us eating and three 14″ pizzas didn’t sound like enough to me, but I was assured they would be. We got one pizza with sausage. 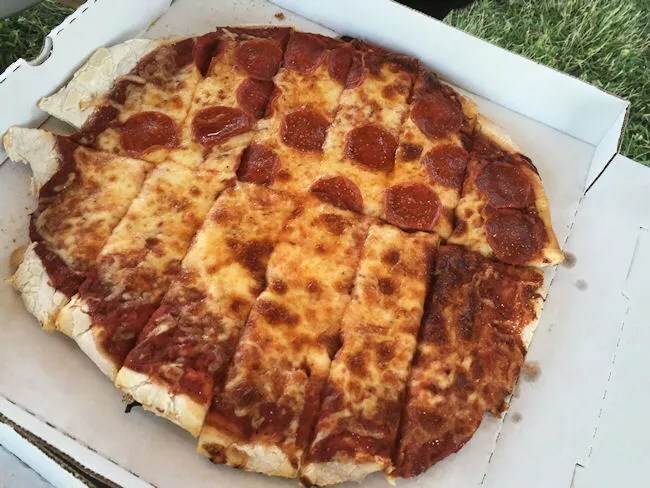 One pizza was half cheese and half pepperoni. 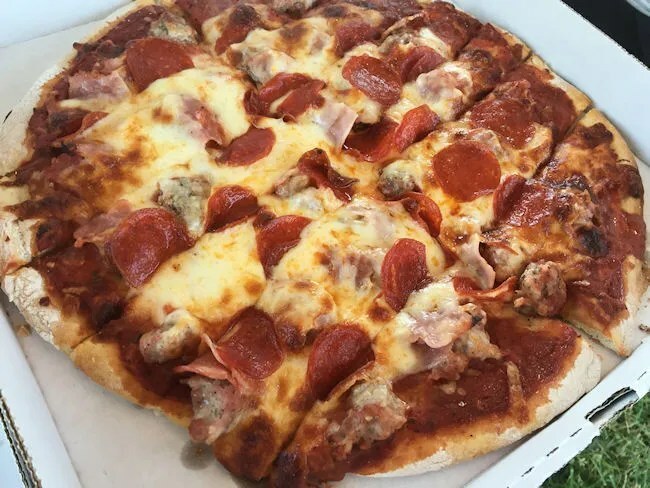 The final pizza was their Meat Combination which includes sausage, ham, bacon, and pepperoni. The cost for the three pizzas was just under $60 and they only accept cash or check. There is an ATM on site…next to the jukebox (which still has CD’s). If you have to use an ATM, this is about your only option. We actually drove for quite a while looking for a gas station to get drinks and couldn’t find one close. When we got back to the campground, I popped open all three and we called everyone back for dinner. The Meat Combination was the first one I dove in to. The thing that makes this pizza stand out is the crust. It’s clearly a home made crust that still has a little dry flour cooked in to. It’s a really soft, chewy crust where that holds on a thick, sweet home made layer of red sauce and a thick layer of cheese that doesn’t quite go to the edges. 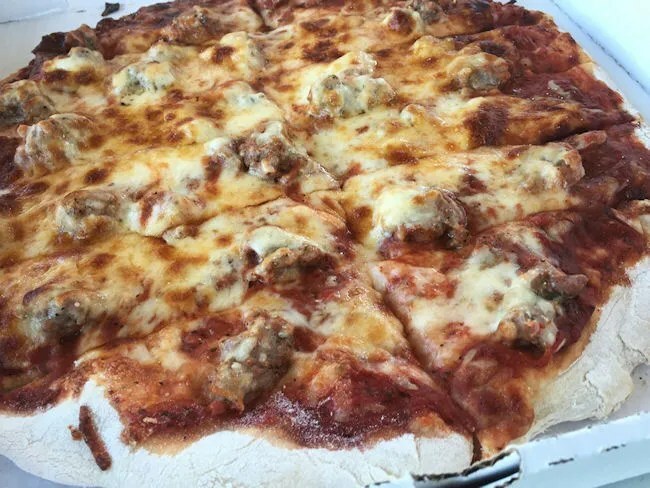 The pizzas are cooked to a golden brown which adds some crunchiness to the exposed parts of crust as well as adding a little caramelization to the sauce. This first pizza had all the meats and they were spread pretty evenly over the whole of the pizza. The sausage is the one that really jumped out. Each piece looked like it had been pinched off a larger piece of sausage. All of the meats were delicious on their own, but the sausage kind of overpowered everything. The only odd thing about the pizza was the slicing. Instead of triangles, or even squares, it was large rectangles. There was one slice down the middle then each half was cut in to six pieces. I didn’t have a problem handling it, but someone went and grabbed a pizza cutter and added a few more cuts to make squares. Since I already felt like I was eating a sausage pizza, I jumped to the pepperoni next. Everything that was great about the Meat Combination is true of both of the other pizzas. The home made crust and sauce really make the pizzas stand out as something unique. The pepperoni were a little bit thicker than the frozen stuff you usually get from pizza places. It was good pepperoni, but it wasn’t anything spectacular. Once the other two pizzas were gone, I headed over to the sausage. Again, nice big pieces of meat were trying to hide underneath the cheese, but it’s kind of an Incredible Hulk situation with the meat just bursting through the top layer. My brother’s father-in-law said this was the pizza he liked and I can see why. When the sausage stands alone, it really stands out. It really could have used a more distinguishing flavor…and maybe a little spice, but as it was, it was still a memorable pizza and the kind, as a tourist, you’ll remember fondly years from now. DiMaggio’s Pizza & Burgers isn’t your typical pizza place. It’s all about nostalgia and a down home, family atmosphere. It’s not fancy, but they put love in to the food which makes it memorable and the kind of place you’ll want to come back to every time you’re in the area.